One of the joys of running a grand, country inn is throwing spectacular theme parties and sharing them with our guests and community. Below is a sampling of our past events. Ring in the New Year at a grand country inn, decorated with full holiday style! Our delicious holiday dinner by Chef Gary Schmidt begins at 7pm. DJ Marble Sphinx kicks off the dance party at 9pm. Complimentary champagne toast for all at the stroke of midnight! Enjoy the warm, lively atmosphere at our festive country inn. Children welcome. Community concert on nearby EarthSkyTime farm with The Mammals- renowned old time folk rockers! 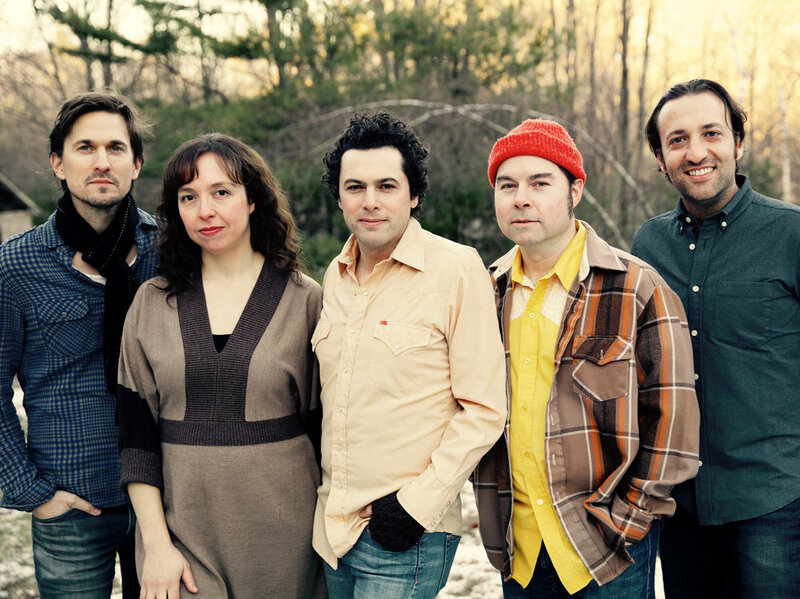 The Mammals is a five-piece Americana band from Woodstock, N.
Cash bar & Bus-fired pizza! In 1936 theaters across the country staged the original play simultaneously. On Sunday, October 23 at 2:00 pm, the Manchester Players will hold a free public reading of the new stage adaptation of It Can’t Happen Here at the Wilburton Inn. It was based on the 1935 novel written by Sinclair Lewis. In 1936, the novel was adapted into a play and theatres across the country opened productions on the same night. To commemorate the 80th anniversary of those productions, regional theatres, universities, and communities across the country will read the new adaptation by Berkeley Repertory Theatre’s Artistic Director Tony Taccone and screenwriter Bennett S. Cohen. The reading will take place at the Wilburton Innand will feature many local actors. It is free and open to the public. For more information contact the Wilburton Inn wilburton.com/manchesterplayers. Click here for information about the national initiative. "It Can't Happen Here", play by Sinclair Lewis and John Moffitt, was written in 1936 in protest to the political happenings at the time (not unlike today). 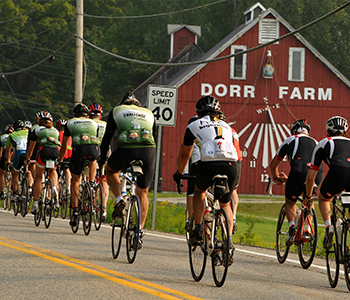 It takes place in a small Vermont town just before presidential elections. It is a radio-style play with many characters. Local actors from the community will be included in this reading. Tajlei Levis, innkeeper at the Wilburton, asked me to find the play - she saw it in Manhattan at The Peccadillo and liked it. It is a powerful piece! When it was written in the 30's, it was performed around the US simultaneously in protest to the scary pre-WWII climate. Very like the scary climate today!!! I'm doing it here in Manchester for the same reasons! We've scheduled the reading on Sunday, Oct 23 at 2:00pm at the Wilburton. Tours of sugarhouse and woods, pancake breakfasts, maple candy-making demonstrations, live music, horse-drawn sleigh rides, sampling of maple syrup and maple donuts, maple cotton candy, maple creamees and other maple goodies to try. The Wilburton Inn is excited to partner with Earth Sky Time Farm and welcome Spirit Family Reunion, Brooklyn's best old time band. Spirit Family Reunion's plays big, high-spirited, old-fashioned, appealingly playful folk-rock ramble, complete with vintage instruments and shout-along choruses. The concert will be a benefit for Rising Tide Vermont, a project dedicated to environmental awareness and climate justice in Vermont. In honor of the opening of the Museum of the Creative Process' new gallery in Manchester Village, we are hosting a weekend of events, workshops, and festivities. Join us for the following happenings: Friday welcome fireside discussion at the Wilburton at 6:00 PM; Saturday morning sculpture walk through Epics of the Goddess on the grounds of the Wilburton, 10:30 AM - Noon; Saturday reception at the Moral Science Project, 4:00 PM - 6:00 PM; Saturday evening belly dance performance and workshop at the Wilburton, 8:30 PM - 10:00 PM; Sunday hootenanny at Earth Sky Time Farm with Brooklyn band, Spirit Family Reunion, 6:00 PM -9:00 PM. 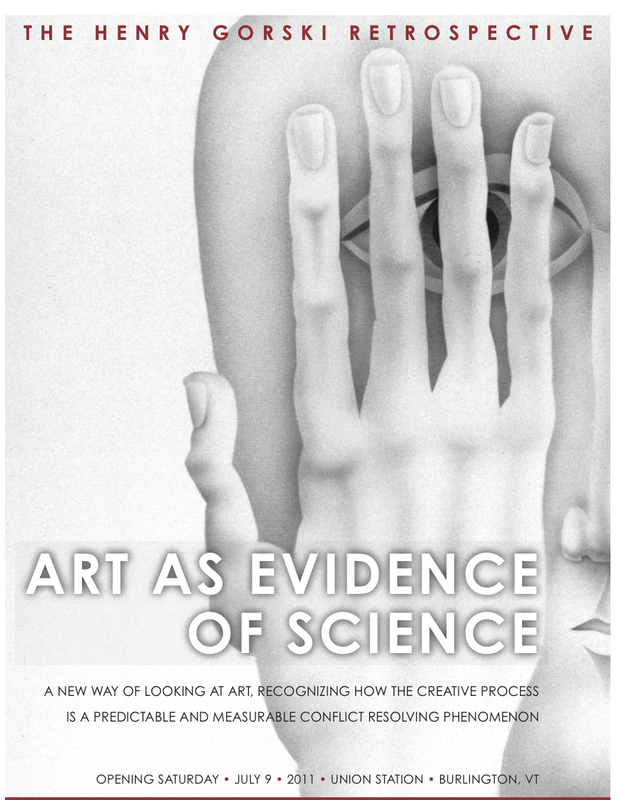 RSVP at info@museumofthecreativeprocess.com. The new gallery is located at 3814 Main Street, opposite the Taconic Hotel. Earth Sky Time is located at 1547 Main Street. Our 4-legged innkeeper Jetson is thrilled to welcome over 120 Cavalier King Charles Spaniels from across the USA to join our 2nd annual Canine Costume Ball! Members of the Cavalier Brigade are coming from far and wide across America to meet up at the Wilburton Inn this weekend and bring their adorable dogs to Manchester. Wagatha's Dog Biscuit Company will give the grand prize and a prize for every 4-legged contestant! 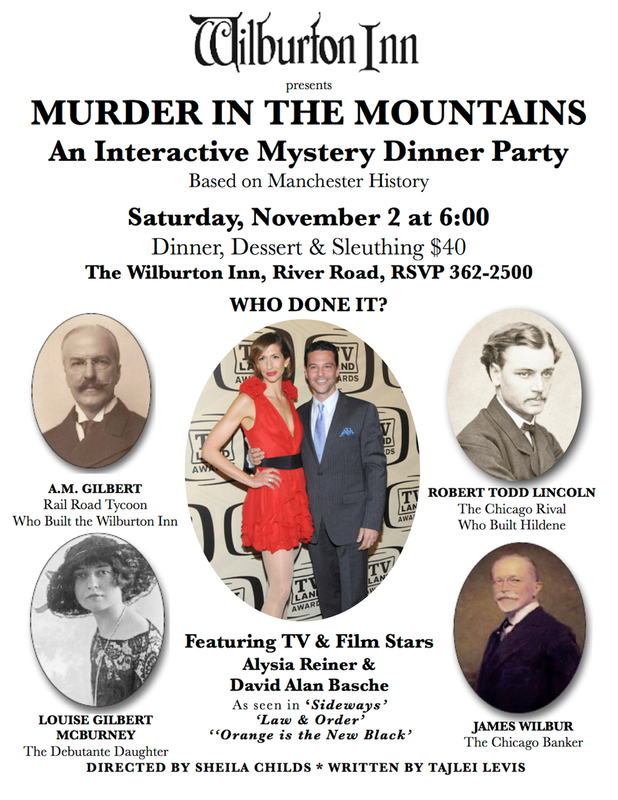 Get away with murder at the Wilburton Inn in Manchester, Vermont for the popular annual interactive murder mystery weekend November 4-6, 2016. Guests are invited to dress up and enjoy their inner Miss Marples and Sherlocks as they follow a cast of actors through the 1902 Wilburton mansion to solve the mystery at a glamorous Gilded Age wedding party on Saturday, November 5th at 6:30pm. Prizes will be awarded best sleuthing and most creative costume. Family Innkeeper and New York City playwright, Tajlei Levis uses the Wilburton’s rich history as inspiration for each year’s original mystery; however the plots and characters are fictional. Last year’s mystery saga, Thoroughly Modern Murder, took place in 1924, as the younger set rebeled against the restrictions of their Social Register elders, bringing the Gilded Age into the Jazz Age. The cast included Brian Drutman (Grammy Award-winning Broadway cast album producer of hits including Wicked, Honeymoon in Vegas and An American in Paris), John Podhoretz (New York Post writer and Commentary editor) and local favorites: Theresa Kloos, Sheila Childs, Harvey Flaxman, Greg Cutler, Tina Cutler and Letitia Scordino. Maeve has helped us transform the Wilburton Inn this Spring and we are delighted to introduce her talents to our guests with this weekend package. Refresh your mind and spirit with an inspiring weekend of home organization tips and how-to’s with home organization expert, Maeve Richmond of Maeve’s Method. Saturday 10:00 am - 11:15 am ‘Ask The Expert’ talk. Discover Maeve's top tips for how to spring clean your home. Bring your questions - photos are welcome too! No pet fees for all the 4-legged children! Join the Wilburton Inn's beloved four-legged innkeeper Jetson for a festive holiday weekend! Pet fees are waived on all dog breeds for the weekend. Portraits will be taken in front of our grand Christmas Tree. Innkeeper Melissa Levis leads caroling and sing-alongs on Saturday from 1 - 5 pm.One lucky guest will even win 2 tickets to Sylvia on Broadway starring Matthew Broderick! $165 per night, no pet fees applied. Go back in time and discover the unique history and beauty of the 13 country inns of Manchester, Arlington and Dorset. Sample holiday cookies and refreshments. Hear innkeepers share their property's rich history. 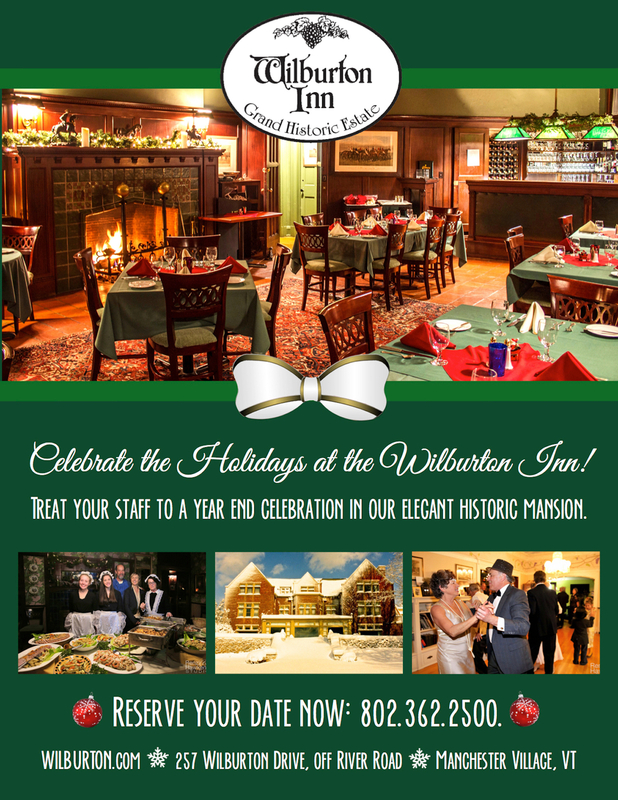 All two night Wilburton Inn weekend guests receive two complimentary historic inn tour tickets. ($35 savings.) Innkeeper Melissa Levis will be leading sing-alongs and caroling at the Wilburton. All guests are invited to enjoy a community pot luck dinner for a small additional fee. Wanderlust events here. Namaste from the Wilburton family. MANCHESTER ANTIQUE & CLASSIC CAR SHOW: CELEBRATING 30 YEARS! Welcome all car enthusiasts! The premier Antique and Classic Car Show in Manchester & the Mountains, Vermont celebrates 30 years of the best antique and classic cars, food vendors and flea market in the northeast! 802-362-6313. The Wilburton is happy to invite you to join us for Mother's Day Brunch. Celebrate the labor and love of our mothers, while enjoying the lovely spring view and the best cuisine in Vermont. Our globally inspired menu features the flavors of the Mediterranean, Austria, India, and of course Vermont. Click here to see the full menu. Complimentary sparkling cocktail for all mothers. Call for reservations! $28 per person, plus tax. Cookies, tea and children's drinks & cash bar. Children under 2 free. 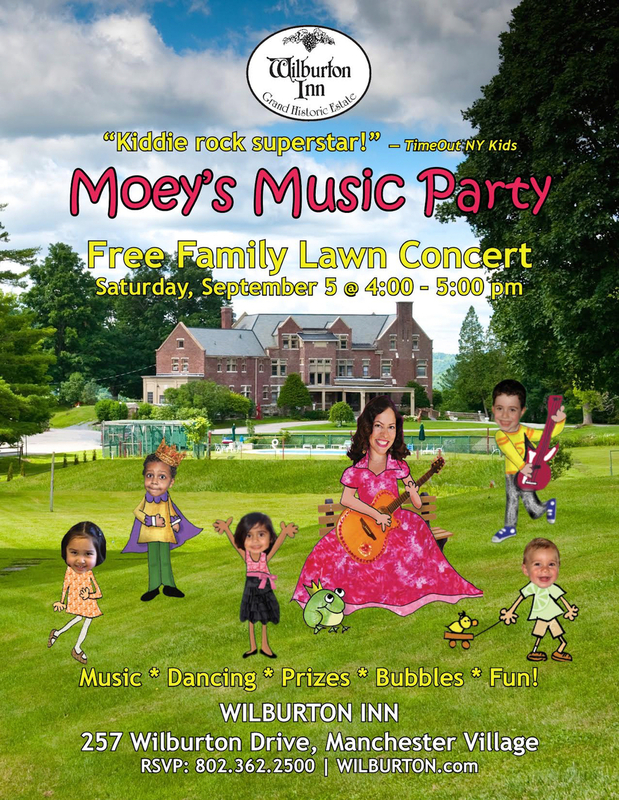 Come have a Sunday afternoon filled with fun at a concert featuring co-innkeeper Melissa Levis, who entertained 10,000 kids a year in New York City with her band, Moey’s Music Party! You bring the kids & your dancing shoes - Melissa will bring her sparkly guitar. Singalong with the entire family for this sparkle-tacular holiday concert. Instruments are provided for all guests who want to make their own kind of music! Delicious dinner, Dancing, Champagne Toast & cash bar. Ring in 2015 at your favorite Vermont Country Inn! Dancing, champagne, food & friends. All welcome. A Vermont themed gourmet dinner. 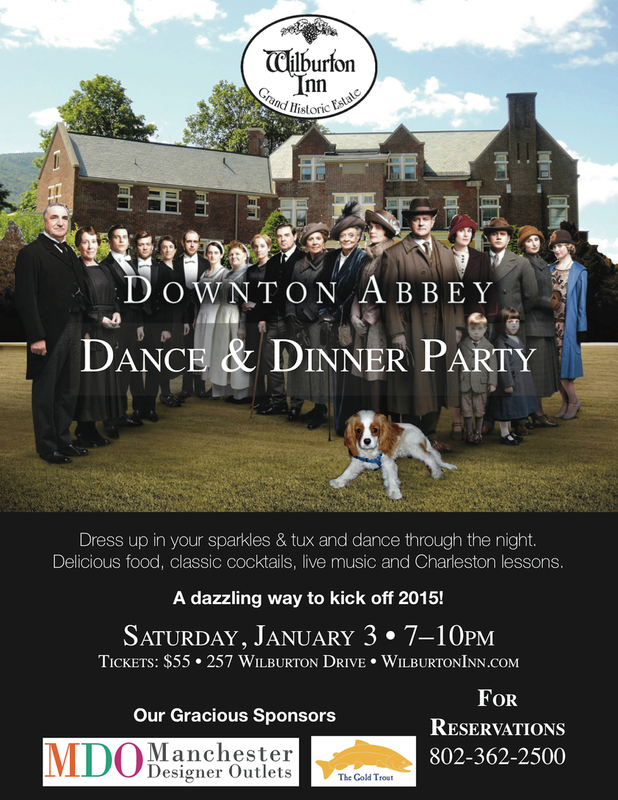 Dress up in your sparkles & tux and go back in time for a Downton Abbey Dinner Dance Party in our own country manor at the Wilburton Inn! Manchester Designer Outlets and the Gold Trout join the Wilburton Inn for a glamorous evening of live music, ballroom dancing, themed cocktails, costume parade, Charleston lessons, and delicious food. Feel like the Lord and Lady of the Manor at this extravagant party to celebrate the new season of the award-winning hit, Downton Abbey. Celebrate the Holiday of Lights with the Wilburton Family. Join us to light Hanukkah candles in our grand living room, honoring that there is always light in the darkness. Bring your own Menorah or light with us. There will be a present for every child, young or old! Baby, it's cold outside. So join us for Christmas carols in front of the Wilburton Inn's toasty fireplace. Grammy Award Winner Brian Drutman will help us Deck the Halls and Winter Wonderland in Vermont! Join the Wilburton Inn and Whistle Pig, Vermont's finest Whiskey distillery, for a fireside whiskey tasting, December 27th, 4-6 PM. Rated "One of the Best Whiskeys in the World", Whistle Pig is a proud promoter of sustainable agriculture and old time fun. Savor the Green Mountain's best Rye Whiskey in the comfort of the Wilburton Mansion. Guests are invited to join us for Dinner following the tasting. Please call to confirm reservations. From horse drawn sleigh rides to historic inn tours, wine tastings, caroling, Elf train rides, lighted tractor parades, and the Wilburton Inn's Moey's Music Party children's concert and Downton Abbey Dinner Dance Party, Manchester Merriment is a 6 week holiday celebration throughout the town of Manchester and the perfect way to celebrate the Vermont festivities of the season. Click here to see all the wonderful programing at the Manchester Chamber of Commerce. The Monthly Nut (How Much Misery Does It Take To Be Happy? This new (darkly) comic monologue asks: Can you love your lifestyle--without hating your life? As James seeks answers, he encounters a boss who worships Hitler, a closeted secret admirer/kidnapper, a movie star and a ghost. James Braly’s last monologue, the critically acclaimed Off-Broadway hit, “Life In A Marital Institution,” recently finished a 14-City National Tour presented by Meredith Vieira Productions, which has optioned it for television (trailer below). $20. Kids under 8, $10. Two and under free. Join us for breakfast and a delightful Broadway singalong — from Annie to Zorba — featuring Brian Drutman, producer of more than 25 Broadway cast albums! Directed by Sheila Childs, the cast includes Weston Playhouse favorites David and Charma Bonanno and New York City’s Brian Drutman. Local actors Letitia Scordino will perform the role of the secretary who would do anything to be on stage; Harvey Flaxman will play the corporate lawyer; and Greg Cutler & Tina Cutler will the bumbling song and dance team, Fred & Pepper. Guests are invited to “put on the Ritz” and dine with the characters, have a screen test, learn a dance number, compare clues and try to solve the mystery. Prizes will be offered for the best dressed couple, best screen-test and the most clever detective. Author Roselle Chartock discusses her new non-fiction book, Windsor Mountain School, about the first co-ed integrated boarding school founded at the Wilburton Inn and later relocated in Berkshire Country. Max and Gertrud Bondy previously ran their school in Germany, but their Jewish heritage and progressive philosophies made them a target of the Nazi regime. They were forced to sell their school in Germany and start anew in America. The Wilbur’s fortune was declining and they were happy to lease the Wilburton Mansion to the Bondys as the American home for their school. Families, including the Belafontes, Poitiers and Campanellas, were attracted to the school for its multicultural and international curriculum. Enjoy a delicious breakfast at the Wilburton Inn followed by the author's reading and discussion of the book. Signed copies of Windsor Mountain School will be available for purchase at the event courtesy of the Northshire Bookstore. Innkeeper, Psychiatrist and Curator, Dr. Albert Levis invites you to the opening of the Moral Science Project and Museum of the Creative Process in the heart of Manchester Village, directly across from the Taconic Hotel. Discover how creativity is the universal expression of the unconscious - and how every person and culture instinctively uses creativity to process conflict resolution. Tour the 100 canvas collection of Abstract Expressionist Henry Gorski to see the conflict resolution process repeat in 5 cycles of a lifetime of art. Learn how religion are all partial discoveries of science created by the psychological impulse of people. Dress up for a fabulous Halloween Evening at the Wilburton Inn! We are excited to welcome Vermont's best Karaoke DJ's to lead the fun. Prizes for best dancing, best costume and spook-tacular fun! Call 802.362.2500 for reservations.